Are you a business-oriented person? Then you would probably be meeting many people every day. It really gets difficult for you to manage all the business cards that pile up on your table and in your wallet. Here comes an app that helps you manage your cards. Yes, ‘WorldCard HD’ is an iPad app which is an intelligent business card manager. This iPad application is the handiest tool for your business. 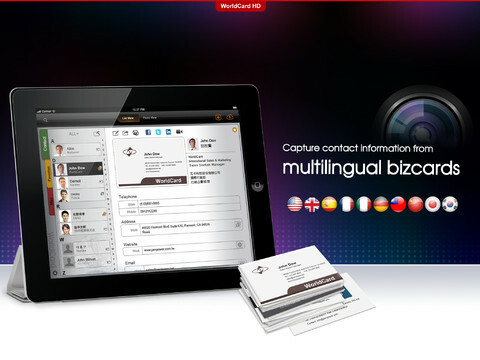 With ‘WorldCard HD’, you can save contact information of multilingual business cards. This is an app that transfers your business card details to your iPad without manual typing, but by scanning them using the iPad’s camera. One of the notable features of ‘WorldCard HD’ is that it uses OCR (Optical Character Recognition) technology to recognize the details. Once you capture the image, you just have to click on the recognize button. Once you open the app, you see 3 icons, namely Contacts, Favorites and Maps. The home screen displays names in alphabetical order. Under the contacts option, you have several choices. Using them you can add a new contact by capturing the business card details through your iPad’s camera. The app automatically recognizes the name, company information, address, phone number etc. You can also add contacts from your album by enabling the ‘WorldCard HD’ local services in the system settings and can also import contacts from the iPad. You can check the contact details and edit them if required with the edit icon. You can export your contacts to cloud, email etc., with the contact management icon. The Favorites icon allows you to select contacts and add them to your favorites. With the Maps option you can select a contact and find out where he is located. It also gives you the GPS information of the contact. The Settings option helps you customize your preferences. It has 3 main options namely, Display, General and Cloud and About. With the display option, ‘WorldCard HD’ allows you to set the display sequence of the first name and last name and the indexing criteria can be set as contact name or company name. With the general option, you can set the index to follow any of the orders like English alphabet, Chinese Stroke, Japanese Phonetics etc. The cloud allows you to share or backup your contacts via cloud services (iCloud/Dropbox) option. The help option of the app gives a clear overview of the various functionalities of the app. ‘WorldCard HD’ is available in languages like English, Chinese, Dutch, French, German, Italian, Japanese, Korean, Portuguese and Spanish. It is a business app costing $14.99 that requires iOS 4.2 or later versions. The best part of the app is that you can scan multiple cards at the same time. You can also contact your friends through email, Facebook, Twitter etc. Except for the price, the app seems to be the ultimate choice for any business person. With ‘WorldCard HD‘ in your iPad, dealing with business contacts will definitely become easier. Ron Fletcher started developing mobile apps a couple of years ago and has been hooked on to it since then. He is a NOT SO geeky techie and likes to research new technology and applications. In his spare time, he does a bit of backyard gardening and loves cooking using his mom's recipes. Seems like Apple wants to take its iOS application practices to the next level. OCR was always there in smart-phones but adjusting the text according to the specific field is quite fascinating. This is the reason that Steve Jobs is considered as one of the genius minds, isn’t it? It may not be the concept or idea of Jobs himself, but his mojo must is the driving force for Apple and its workforce to continuously evolve in technology for better applications.